As the field of human rights in business is taking shape, teaching and research in leading business schools is an important element of this process. globalisation, immigration, income inequality and diversity, climate change, digital disruption as opposed to digital learning, the future of jobs and work, uncertainty in predictions, responsible leadership creativity, and innovation and entrepreneurship. While Professor Bocardelli’s list does not include human rights explicitly, many of these trends have built-in human rights dimensions. Unlike most other topics, human rights are rooted in a firm and widely accepted foundation, the Universal Declaration of Human Rights. There is also growing consensus that any corporate involvement in abuse of human rights is unacceptable and that corporations have a proactive role to play in ensuring respect for human rights, particularly in business environments in which governments are unable or unwilling to protect their own people. Read the full article as published by the Global Focus EFMD Business Magazine. 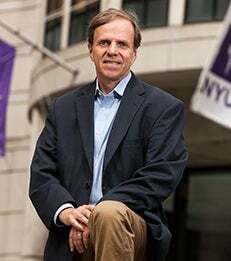 Michael Posner is a Professor of Business and Society and Director of the NYU Stern Center for Business and Human Rights. Dorothée Baumann-Pauly is the Research Director for the Center for Business and Human Rights.